When I was about four years of age, my family and I visited Gulf Shores, Alabama with relatives. I was at a stage of my life in which my fascination was switching from the science of human blood to horses. I decided I wanted a beautiful equine of my own, and I wanted it right then and there, though I was a military child. Adults, patronizing as they are well-meaning, tend to tell children to wish upon a star for such lofty desires – accompanied by a prayer, of course, to make it legitimate. A horse at Fair Hills Farm! I stood on the upstairs deck of a beach condo and stared at the stars in the night sky for awhile. I tried to focus on one star in particular and pray God would give me a horse. I figured I ought to add in some specifics to make the request more defined. The landscape around me was dark. Perhaps I remembered the Black Beauty book Grandmomma gave me for Christmas. Please give me a black horse with a flowing mane and tail, I added. I might have inserted a petition for a white star too. Afterwards, I came downstairs and told everybody I saw a star and prayed for a horse…so I was going to get one now, right? No, I was told. Sometimes you have to wait. The more time passed by, the less likely it seemed that my childish request was going to be granted, so I forgot all about it. I took riding lessons and placed second in an equitation class in a horse show at the age of eight. But opportunities to work with horses soon faded after that, although I ended up with some little sisters who had a passion for horses from the get-go. Despite having retired from Army life in the countryside for nearly a decade, we still did not have a horse, regardless of any cajoling from grandparents and friends. Last fall, Mary, over fourteen years old and looking for opportunities to do something with horses, came across an ad in the Buy/Sell Bulletin or online for Feathered Friends Cockatoo and Horse Sanctuary, run by a sweet lady named Emily who offers the option of sponsoring a rescued horse for $50 a month in exchange for visiting and enjoying the horse. Mary began sponsoring an elderly white Arabian mare named Splenda, a very gentle horse fit for giving pony rides and being ridden at a very slow gait. 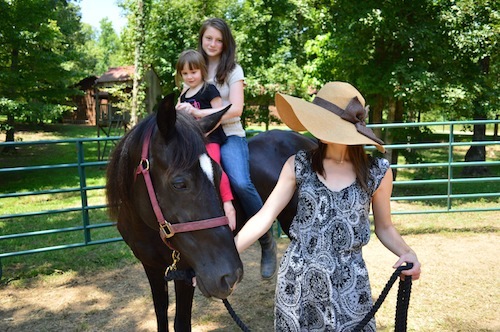 When I came along one day, Emily asked if I would like to try riding “Blackie,” a tall, black, purebred Tennessee Walking Horse mare who was just shy of her eleventh year. She had a spunkiness about her and seemed a little intimidating, but I hopped aboard, even with the stirrups of her tremendous Western saddle feeling a bit too long for me. A blindness in Blackie’s right eye contributed to her being discarded after a career as a show horse and broodmare. I had never had any interest in Tennessee Walking Horses, particularly due to glimpses of the artificial constraints within the TWH industry show ring looking so painfully atrocious. 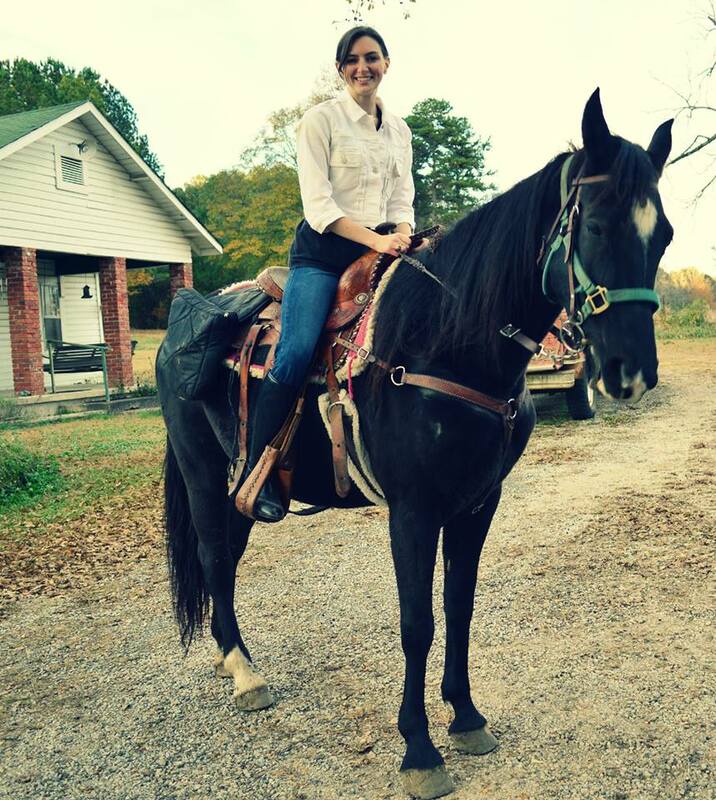 A Tennessee Walker was a lazy person’s horse, so I thought. Riding her smooth gait at quick speeds had a feeling of being in an airplane taking flight – so hovering and smooth over the ground it was almost unnerving. But I liked it. I decided to sponsor Blackie myself. Emily told me that Blackie’s real name was something more elaborate, which I could discover on her TWHBEA papers. Ebony’s Midnight Jubilee. I’ve preferred to call her “Jubilee” ever since I’ve known that. When good pasture and barn space dwindled during the winter and overcrowding of horses ensued, Emily offered to give Blackie to me. During the thrilling yet hectic time of filming the first scenes of Romans XIII, I read aloud the meaning of “jubilee” in Scripture. Perhaps it would make perfect sense to keep the horse out at Reads’ Mill for awhile – a return to the insignificant land of my ancestors. When Jubilee arrived, she was scrawny, scruffy, and had rain rot lesions all over her back. It would take months of feeding and grooming her with essential oils to get her back to a healthy condition. On the 2nd of July, we finally got to bring Jubilee out to our own land, confined by a round pen we bought from the neighbors. She adapted faster than we anticipated, actually, and enjoys being hand grazed and carries us ’round the trails and pond. She still has some training and conditioning ahead. “A girl and her horse is definitely true” – some ridiculous journal entry made by 6-year-old Amanda Read many years ago, in attempts to let readers know that her journal was not fiction. So, that prayer upon a star really did come true. It only took 20 years!